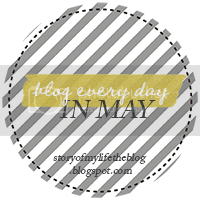 Welcome to "Blog Everyday in month of May!" Today's theme is a moment in your day. I decided to share a recent project I did on Instagram called #adayinthelife. I was a neat way to document a typical day for me and I will be doing these seasonally. Lost of people on IG participate and the project usually happens on the first of a month. I will be sure to post here a few days before the next project or you can just join in with the hashtag #dayinthelife on the first of every month! PS. If you follow me on IG I am sorry for the second time around photos and if you don't follow me, please do! Afternoon (left to right)- preparing for a meeting, meeting doodles, leaving work (! ), picking up my bug! Evening (left to right)- snack time & walking Bella, dinner for the bug, prepping blog post, & nightly rituals. Looks like we have similar lives.